Matt Purple, managing editor of American Conservative, responds to recent demands for Gun Control from sort-of-conservatives Brett Stephens and David Frum writing respectively for those famous conservative organs The New York Times and the Atlantic. The reason many of us take the (authentically) Madisonian view—in addition to our leeriness over a total government monopoly on arms—is that we reject such a crusade as impractical. We see it as premised on a fundamentally false conception of America, one that glosses over her indelible traditions of individualism and defiance. We worry it will result in more polarization and violence rather than less. We observe, too, that the public has lately grown weary of elite designs on their values, their pronouns, their national anthem—enough to elect Donald Trump in the hopes of making it all stop. Presumably an additional betterment campaign against their guns would be met with the same aggravation and pushback. It’s your move, gentlemen, but is this really where you want to go right now? 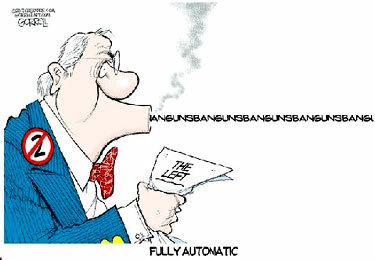 2 Feedbacks on "Fully Automatic Establishment Gun Control Demands"
Self-righteous leftists can’t deal with tradeoffs (sometimes known as opportunity costs). They could not ever conceive of weighing the negative impact of futile legislation on millions of lawful gun owners against the minimal possibility that one or two (I’m being generous here) gun homicides might be prevented. They don’t like guns and you’re just going to have to change your life (and the Constitution) to conform to their sensibilities. The 21(?) Sandy Hook children’s blood hadn’t dried when CT and NY banned dangerous-looking, black rifles with pistol grips and flash suppressors; and high-capacity magazines. They were hugely successful on two levels. One, there hasn’t been a school shooting since December 2012. Two, there were newly-minted approximately one million felons who ignored the asinine, unconstitutional laws.